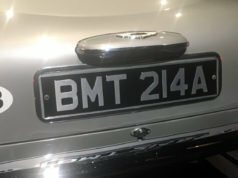 Sean Connery wears a number of trilby hats in his first five Bond films, and at least the hat in Dr. No is identified as being from Lock & Co. Hatters. The closest hat to Connery’s trilby in Lock’s current range is the Sandown model. 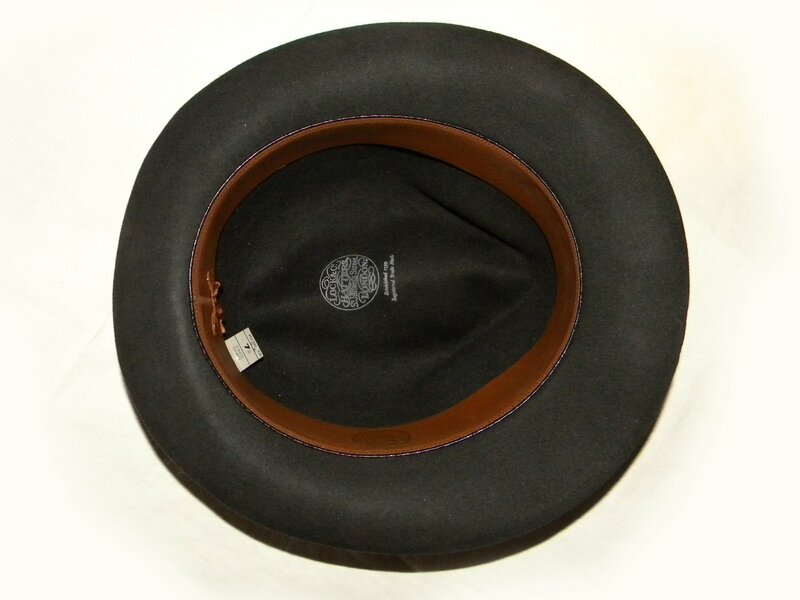 It has a tapered crown and a short 1 7/8-inch brim that is turned up at the sides and back. However, the Sandown is only available in medium brown, which is nothing like the colour of Connery’s hat. Lock claims that the Sandown in the colour they offer it in is exactly the same as Connery’s hat, but the hat in Dr. No looks much more like either a darker brown or a muted green, depending on if you look at the DVD or the Blu-ray. 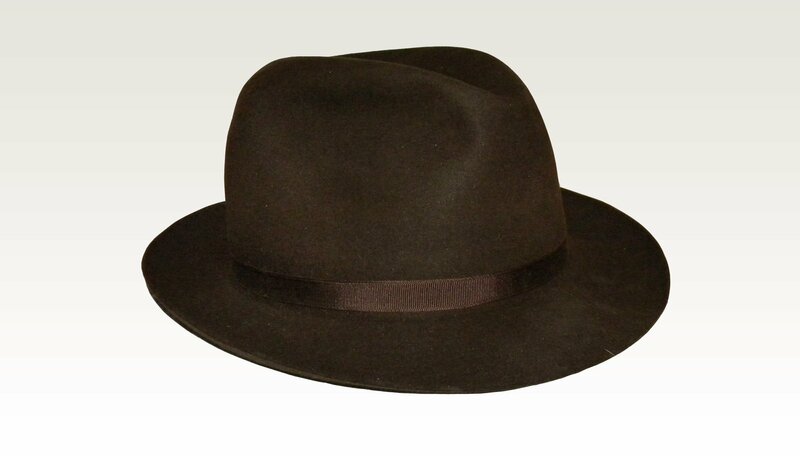 Lock sells the Wetherby in dark brown and gren, but the brim isn’t quite the same. It’s impossible to compare what Lock sells now to what they sold over fifty years ago because no matter how similar their hats are, not everything they offer is the same. As for the short-brimmed model, Lock used to make it in other colours. I have two vintage Lock trilbies with 2-inch brims, just a little larger than the Sandown has. 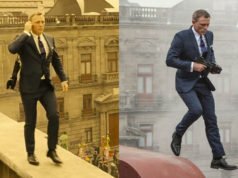 But like Bond’s hats, neither of my hats can be found in Lock’s current catalogue. I do not know how old these hats are. 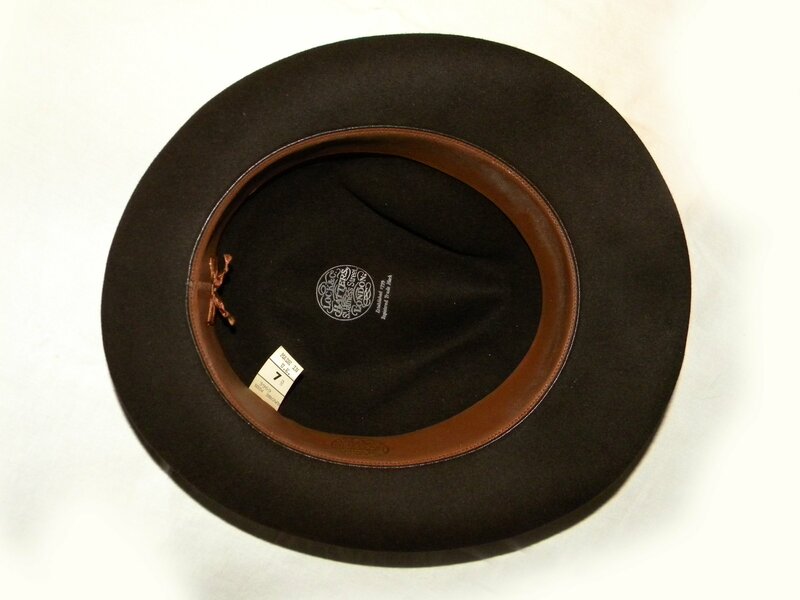 One trilby is in a rather dark brown called “new brown,” and it has a half-inch brown grosgrain ribbon at the base of the crown. It’s very similar to Sean Connery’s hats in From Russia With Love, Goldfinger and Thunderball. My other trilby is in a dark grey colour called “coke,” and it has a half-inch black grosgrain ribbon at the base of the crown. Unrelated to the name of the colour, Lock also uses the name “coke” for their bowler hats. Both of my hats have a light brown leather band inside and no lining. And both hats are identified by model number 3969 on the inside label above the colour name. They are blocked with a centre dent and a front pinch. Very nice hats, Matt. 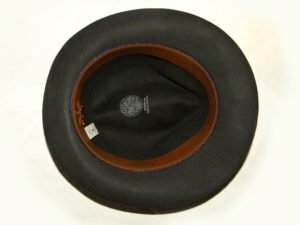 Are there any classic American hatters still in business? I wonder if we will see Bond in a trilby again? The only men I regularly see wearing them these days are 60-80 years of age. That said, it could suit the “old-fashioned” direction they are taking the character, assuming they stay with that theme. Optimo Hats is one of the finest hatmakers, based in Chicago. I have a couple of vintage felt hats that belonged to my Grandfather that are in excellent condition, however both are in lighter shades of brown. What is the protocol for matching hats to a suit or sports jacket? Lighter browns go well with brown suits and sports coats. They can also look good with medium to light grey suits. Depending on the shade and hue of the brown, it may look okay with navy. Turnbull & Asser in New York and Brooks Brothers sell the Lock Wetherby in dark brown, which is a trilby similar to hat that Connery wears in Dr. No. Optimo has a “Trilby”, which could be a good alternative. You’ll need to have the ribbon replaced with a narrow one to get the English trilby look. Those look great and are exactly what I would select. However, as much as I would like to wear hats I struggle to not feel that I’m making a “statement” wearing them. I think with my thin and short clippered hair, they’re practical, but when I see other men wearing hats, I definitely don’t want to be associated with most of them. Do you have any advice for wearing a hat without going “vintage” or looking like bohemian alternatives wearing them for kitsch value? I began wearing hats a few years ago because I live in Australia and my family is susceptible to skin cancer, but I also just liked the idea of wearing hats. Since I wear suits every day I couldn’t very well go walking about in a baseball cap so I started wearing similar hats to above. I like you I couldn’t shake the thought of looking like a someone looking for attention, so my Akubra sat unused for about a year. After getting badly sunburnt ears and nose one day I decided I had to bite the bullet and do it for health reasons. After a while it became second nature, to wear it. Now it feels weird not to wear one. While there are always a few people who immediately judge you I’ve found they’re usually not worth the time anyway, and that the vast majority of people simply don’t care what you wear or actually compliment you for it. So I’d like to tell you to do it, because I’d love for hats to come back in. I think they look great and it’s a real shame that people forgo the practicality of wearing one because it’s not in fashion. They work best if you’re wearing a suit or a sports coat. Keep the brim between 1 7/8″ and 2 1/8″ for that classic trilby look. It looks more modern than a wider brim but it’s not the narrow trendy look either. If you are uncertain about wearing a hat I’d suggest buying a not particularly expensive one to begin with. Then wear it when it is raining. A raincoat and a hat is often far more practical than an umbrella, particularly if you have a bag or bags to lug around, I’ve found. I tend not to wear hats unless it is raining (or Panama style straw hats in the summer). 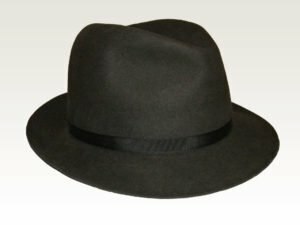 Because there is a practical reason for wearing it, you won’t feel as though you are standing out so much (although a fedora combined with a trench coat can make me wonder if I look like an unsuccessful Bogart impersonator). When I do wear hats, I tend to get complimentary comments. A number of people have said that they would follow suit, which suggests there are a reasonable number of men who would like to wear hats but for some reason don’t or are embarrassed to do so. Pop one on on one of the many grey, wet and drizzly or rainy days we’ve been having. What they all said. Don’t be one of those clueless guys wearing a fedora or trilby with a t-shirt and cargo shorts. Just be confident and get something around the $50 range… not so expensive that you’ll regret it if you end up not wearing it and not so cheap that it will fall apart in a few years. Fur felt may be the preferred option, but it’s not something I’d get for someone just dipping their toes into hat wearing. Those are very nice hats. They seem to look exactly like the two hats Sean Connery had worn in Dr. No and From Russia With Love, respectively, as they appeared to have a different color in each film. The trilbies were some of my favorite parts of the James Bond films from the 1960s. I especially like the navy trilby with the wider ribbon that George Lazenby wore in On Her Majesty’s Secret Service. I agree that it is generally best to wear a felt dress hat with a suit, sports jacket, overcoat, and a rain or trench coat. Most of the time, I wear my hats for rain or cold weather, although I have other felt and straw hats I’d wear during hikes or similar rugged outdoors situations. My three dress hats are a vintage ’40s or ’50s pale grey Stetson with a 2 1/8″ brim, a wider brimmed fawn Akubra Federation IV, and a modern Silverbelly Open Road hat by Stetson, although due to the powder Stetson puts on their modern hats, I never wear the latter during the rain. The former two could handle rain very well, and I certainly recommend the Akubra to anyone interested in a durable, quality felt hat for such weather. My hats are a bit different from the ones that Connery wore, but the 1/8″ wider brim makes a difference. My brim doesn’t turn up as much as his did, but the wider brim is better for my large head. 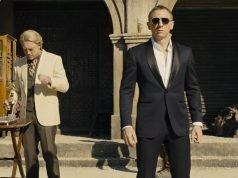 I’d still love to get my hands on something similar to the hat Connery wears as Bond when he’s golfing with Goldfinger (described in one of this site’s early posts). Never seen one quite like that. Please give me your opinion about the Bond Trilby advertised on Christy’s website. What do you think about that Bond Trilby in ink blue or in brown?